Racine County has funding for riverside redevelopment site. | Vandewalle & Associates, Inc.
RACINE 5/9/14— Racine County has secured an $80,000 Fund for Lake Michigan grant that will allow Belle Harbor Marina to be filled in to make a larger riverside redevelopment site. 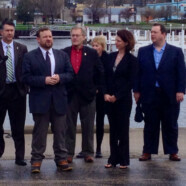 The grant was announced at a press conference Friday morning in Racine. The project will increase the size of the site from 3.3 acres of hard surface to 4.1 acres.